It is time to finally get over the misconceptions generated by the loud and misleading rhetoric regarding the superior efficiencies of close-coupled and liquid cooled server cabinet solutions, as well as the supposed limits on power densities that can be effectively cooled by air. Passive air cooling can successfully dissipate as much heat as can be generated by commercial servers that can actually fit in a 42-45 U cabinet, and in fact more than most close-coupled and liquid-cooled solutions. 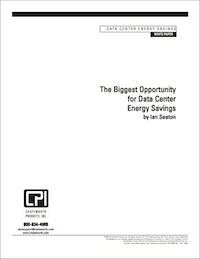 In addition, air-cooled solutions that rely on complete isolation between supply air and return air are more efficient than most close-coupled systems and provide access to lower data center cooling costs and energy savings.